It was 2014 and my business partner, Mark, and I were looking at new markets. We’d dipped a toe into the nuclear sector and could see real potential in it for us. We knew it was going to take time to develop – finding a niche, building clients and getting a reputation always does. So I decided my role was to find out as much as possible about all areas of the sector while at the same time getting our name known. We became a member of the National Skills Academy Nuclear to raise our profile in the area of nuclear new build and generating. Getting involved with the NDA and the area of decommissioning was another part of that process. When I came across the pilot NDA SME Mentor Scheme I just thought – grab it with both hands. It’s free except for my time, I can work with someone who has experience of the sector, and I can learn more about the NDA which will help me see the opportunities. It helped that part of our business is training mentors so I knew the advantages mentoring can bring. It was nice to be offered the chance to have some myself! I say ‘our’ rather than ‘my’ because by the end Mark was joining us for the meetings! Our mentor, Matt Tuck, was someone based close to us which made meeting easier. Matt said he didn’t know what he could offer but it’s easy for mentors to forget just how much they do know and what that knowledge is worth. As important as anything is all the tacit knowledge that you pick up along the way, just by being part of the system. At the first meeting, I don’t think either of us really knew what to expect. We worked through the first meeting guidance which helped a lot and I found that hearing about his career path and what his business did was an education. In total we met 5 or 6 times as mentor/mentee over the year - I was a bit worried about that when it was supposed to be once a month. But life gets in the way and it was reassuring to find out that that was about average for the others. We’ve had lots of benefits from the scheme. Each time we met I learned a bit more about the sector, the organisations involved, the role of the NDA, the inevitable acronyms. Mark was doing his training for the Nuclear Triple Bar Manufacturing and Matt helped him with background reading. We were invited to be part of the North Wales SME Steering Group for the NDA where Matt is the chair, which has been great for a number of reasons. I can see how committed the NDA is to getting SMEs involved in the supply chain and that’s very reassuring. We have ended up getting a contract as a result, which is great - in 2015 we were asked by the NDA to tender for the mentor and mentee training for the next cohort of the scheme and were successful. But the contract wasn’t given to us simply because we were mentees. The scheme is about helping small businesses to understand the processes and complexities rather than awarding work to members. However, being part of the scheme did raise our profile and this opened up an opportunity that we took. I think that almost everyone who has been part of the scheme has gained something positive from it, including the mentors! Even, as was the case with a couple of mentees, realising that the sector is not for them was a positive result – they can focus energy elsewhere. From the first meeting it can be hard to identify how the scheme might work for you but it’s all about the relationship, like any mentoring. It develops and the opportunities open up with that. The NDA is committed to getting SMEs into the decommissioning supply chain – there is a lot of business and money there that can make a big difference to small companies. But the supply chain is complex and it can be hard for a small business to find a way in. 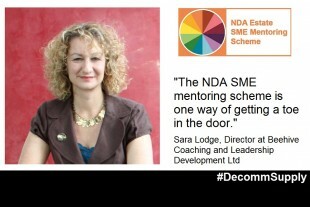 The NDA SME mentee scheme is one way of getting a toe in the door. All it costs is a couple of hours of your time, once every one (or two) months. Closing date for applications is 15 April 2016. For any of you needing to bust some of the jargon used in the nuclear industry, Burges Salmon maintains a comprehensive glossary of key terms and acronyms to assist those who are new (or experienced) in the UK civil nuclear industry. The glossary explains and de-mystifies some of the terminology.